Any business that uses QuoteWerks and Microsoft Dynamics CRM. Microsoft CRM users that would like to enhance the quoting capability by implementing QuoteWerks. Users that want to improve their productivity working with the two systems seamlessly. Enables the QuoteWerks user to link a document to an existing Microsoft CRM Opportunity. Seamlessly linking the Opportunity into the standard QuoteWerks integration for ongoing updates. Enables the QuoteWerks user to update the details of the Microsoft CRM Opportunity. Intuitive and user friendly. Just click the 'Link to MSCRM Opportunity' menu option from the QuoteWerks Tools menu, select the required Opportunity and let ConnectIt-MSCRM do the rest. Many configuration options so that ConnectIt-MSCRM will work to suit your business requirements. Supports QuoteWerks v4.0 build 17 to v5.3 build 6.06 Standard, Professional and Corporate editions. Supports Microsoft Dynamics CRM 3.0 Small Business and Professional editions, and CRM 4.0 Workgroup, Professional and Enterprise editions. These online demonstrations illustrate how easy it is using ConnectIt-MSCRM software to link your QuoteWerks document to an existing Opportunity in Microsoft Dynamics CRM (a feature not available in QuoteWerks 4.0). The interface is intuitive to use and does not require the user to leave the QuoteWerks application. Please click on the player and images below to view the demonstration videos of the ConnectIt-MSCRM software. To purchase your copy of ConnectIt and start taking advantage of its time saving capabilities, please contact your local QuoteWerks or Microsoft Dynamics reseller or contact us direct. You can view screenshots, plus get a huge amount of information on every single option available within the ConnectIt software on our support resource page. On the Support Resources page, just click on ‘MSCRM’ and scroll down to the Step-by-Step Guides section; the Linking Opportunities and Configuration documents provide the most information for you to get a better understanding of the ConnectIt software. Click here to go to the ConnectIt-MSCRM pricing page. 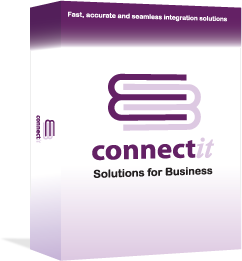 Click here to download the latest version of the ConnectIt-MSCRM software. If you would like help installing or setting up your ConnectIt software, then please see this page.